I do love a patterned skirt! | Is This Mutton? This year I only bought one and so far I've only worn it once. I'm just not feeling the love for the Prince of Wales check skirt. It's a bit serious looking I think. Unlike this divine skirt from a brand I'd never heard of, Mistral. They had an ad in one of the Saturday supplements last week, featuring this skirt, jumper and tights (in matching blue). It was love at first sight, even though I don't normally wear these colours. It's a British firm and they have a few shops as well as an online business. They create their own prints and add unique little touches to their clothes, which are high quality. 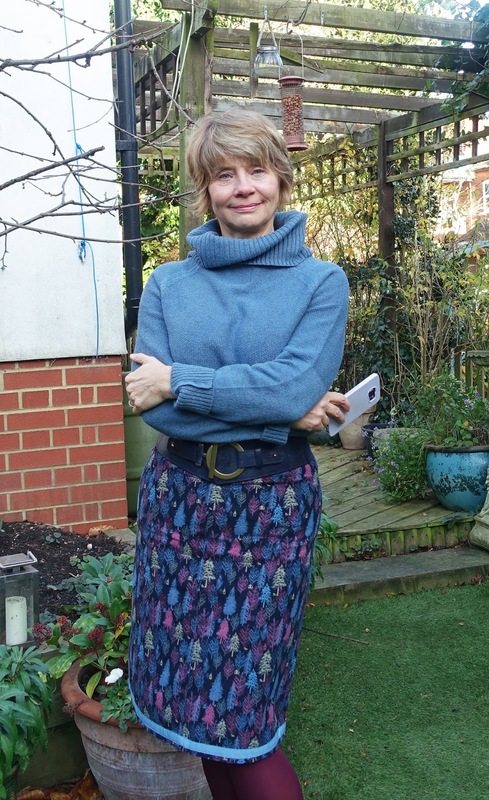 I took a chance ordering the skirt in a size 10 (US 6) - this used to be my Boden skirt size but I'm still trying to lose half a stone, having nearly succeeded following a bout of campylobacter. The size 12 was out of stock. The good news is, the 10 fitted fine. The jumper/sweater has a floppy cowl neck which I like. 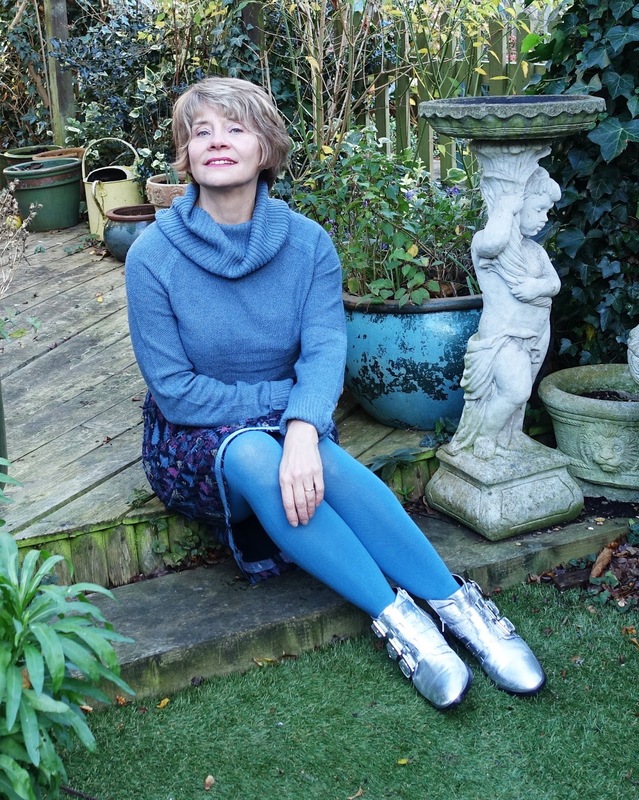 I tried burgundy tights too, which I preferred, and it gave me the chance to wear my new blue/pink Poetic Licence shoes. I think I'll be back to the Mistral site again because they have several skirts that have caught my eye. Boden, look to your laurels! Your "fun skirts" are no longer fun enough. By the way, if you have spotted my phone in a few photos lately, you must think I'm a very sad case who can't be separated from her Samsung. The truth is, I have a great app on the phone that makes it act as a remote control when I use the camera on timer on a tripod. I try to hide it but not always with success! Forest print skirt in eclipse, Mistral; on the button jumper, Mistral; storm blue tights, Mistral; burgundy tights, last season; Poetic Licence Schools Out shoes, Amazon. Belt; Once Upon a Belt. Silver ankle boots, Asos, old. Love the skirt! The print is really pretty and those silver shoes are amazing! Really fun outfit. I think you've found a site that's you. You're looking good after that bug. I need a dose of that. Except not really. I know it's awful and notifiable in the UK I think. I lose a few pounds after the campylobacter but unfortunately have since put them on again! I recognised your skirt as one of Mistral's straight away! I have a similar one ;-) Those Poetic Licence shoes are stunning and I love the silver boots too! Thanks for linking up! I've been on the Mistral mailing list for several years but haven't bought anything yet! Brakeburn is another British brand who have some amazing patterns. I will check out both brands, thanks! That's a great skirt Gail! I'm a skirt person and will have to look out for that site. But can I say your shoes have to have a mention - they're amazing! You've got a great eye for shoes! Thanks Penny! I like a flat shoe or low heel and it's great to find shoes that are funky and comfortable! Thanks for linking up to Top of the World Style. It's a great skirt for the office Christmas party. Your silver booties are stunning! What cool and funky shoes, LOve them! The skirt is beautiful and fits you perfectly! I love the print!